This Feb. 19, 2015, file photo shows a Frontier Airlines flight lifting off at Denver International Airport. The parents of two children (above) say they weren't told about the kids' whereabouts when their Frontier flight was diverted. Two young children flying unaccompanied from Iowa to Florida last month were taken to a hotel for the night when the Frontier Airlines plane was diverted, NBC News reported. Their parents say they were never told where the children, 9 and 7, were, only learning the children were heading to a hotel when the 9-year-old texted them from a borrowed phone. "I think I just I felt helpless. 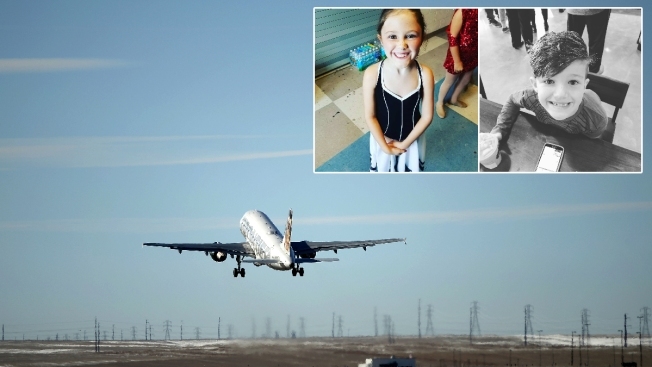 I felt guilty for even putting them on the flight," mother Jennifer Ignash said. "I thought 'Are they scared? Are they warm? Do they have food?' I do not blame Frontier for the flight being diverted. I fully understand that. But I do expect communication." A representative for Frontier said the children were attended to in accordance with Frontier policy and that their records show the children were in touch with Ignash. There are no federal regulations governing unaccompanied children on flights.